Meet Leo! Leo is a 9 year old Great Dane and as active ever. He has a few medical issues which could only be addressed by neutering him so he is now recovering well in his forever foster home. Sweet Bailey!! 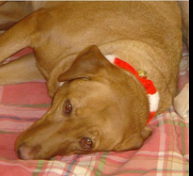 Bailey is an 11 year old red fox lab that was surrendered to rescue in April of 2012 when her family had a newborn baby that was very allergic to dogs. Bailey is the entire package!! She is great with other dogs, great with kids and loves people. Bailey does have a medical condition where she is prone to seizures. They are very small, but you never know when one might occur. After one happens, Bailey wakes up and looks at you like "what just happened?" She is great dog and we are very happy she will live out her years with us. in her forever foster home.